They are America’s veterans – and we need to support them much better than we have as Americans. The Top Seven Percent are not a monolithic group. Each veteran is as different as one person is to another in the general population. I have come to understand that being a veteran definitely can feel differently according to each veteran’s period of service and for each individual veteran within those eras. For example, World War II vets mostly came home to rousing celebrations, ticker-tape parades in New York City – a hero’s welcome by any measure. The Korean War, generally called the “forgotten war”, produced veterans who simply “returned” to their homes and in many cases, just went quiet. Vietnam War veterans experienced combat operations almost every single day during their one-year postings. They came home to a mixed bag of welcome back levels ranging from complete shunning to serene and respectful acknowledgement usually done in private family settings. 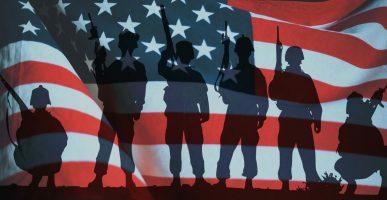 The majority of today’s veterans belong to two groups: Gulf War Era I (1990 to 2001) and Gulf War Era II (2001 to present). Gulf War Era II vets, whose median age is 29, are seeing more combat and experiencing more injuries over a much longer period of time. Era II vets seem to resemble Vietnam Era vets more and more every day. Battle stress and fatigue, family separation issues and post-traumatic stress disorder are taking their toll on these heroes. Thirty percent of these vets have serious service-connected disabilities vs. 25 percent of the Gulf War Era I vets. Now for what the official statistics do not reveal: a sizable percentage of returning veterans wind up homeless and about one fifth of those homeless veterans are women. A greater percentage than that are on food stamps. A greater percentage than that cannot get adequate and timely care at their local VA facility. We can and must do better. Nearly all of the veterans I meet, however, share a love and respect for inclusion – an American value. Vets have learned over time and through training to appreciate and value each other. When your very life depends on your buddy’s actions in combat, you quickly learn that we are all dependent on each other to get through – to get home again. The military is indeed a microcosm of our society and it must therefore accept potential members solely based on merit alone. For example, I am proud to salute the women recruits who are now training to become Army Rangers, Airborne troopers, Infantry, Seals, Special Forces and other combat-oriented fields of military endeavor. Sometimes today’s veterans like to remain somewhat in the shadows, not draw attention to themselves and just minimize their veteran status or identity. I think this happens for several reasons – first, we are taught as military members that the collective win and praise is far more important than individual recognition. It is rare you would see a veteran seeking media fame and visibility for his own individual actions in combat (this is the exception and not the rule). Another reason for veterans not seeking the spotlight (but certainly there are more) is that veterans take different amounts of time to process what has happened to them in repeated combat deployment, family separations, financial crises and challenges, etc. They can “go quiet” during this processing stage. We need to do everything we can to help Era II vets reintegrate back into their communities. To that end, the John Ben Shepperd Public Leadership Institute announced recently that it intends to write a veterans community reintegration scenario for its groundbreaking JBS Crisis Leadership & Learning Center (CLLC). This scenario will bring together national, state, and community agencies for a synergistic review on veteran’s challenges as they come home to us from their active military service. This important session will cover the entire range of veterans’ issues: health, integration into the workforce, education and any other facet of a veteran’s life in society. As a director on the Permian Basin American Red Cross board, I will soon be hosting veterans’ reconnection workshops – a free, confidential program with modules such as dealing with stress, coping with depression, communicating clearly, managing conflict and supporting children. Let’s give the nation’s Top Seven Percent some top treatment and put teeth into what we say about helping them reintegrate into the communities that they left. Military service members postponed their civilian careers and education for the high calling of defending our way of life. For our part, let us not postpone our help to them as they return to their communities, resume their lives and rejoin their families they thought about every day during their service to our country.